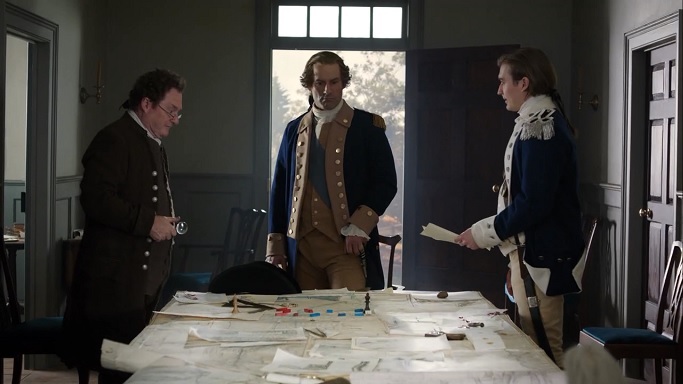 Ian Kahn as George Washington, Seth Numrich as Benjamin Tallmadge and Stephen Root as Nathaniel Sackett. Just one day after the 283rd birthday of George Washington, AMC announced the premiere date of the second season of TURN: Washington’s Spies. 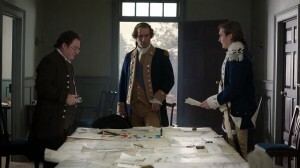 Returning in a two-hour season premiere on April 13, 2015, the plot is said to see George Washington (played by Ian Kahn) fighting his personal battles, as well as leading the Continental Army during the Revolutionary War, as well as continuing the adventures of Abraham Woodhull and the Culper Ring. The first season followed the George Washington, and the formation of the Culper Ring, featuring Abraham Woodhull (Jamie Bell) as he worked with Major Benjamin Tallmadge (Seth Numrich), Lieutenant Caleb Brewster (Daniel Henshall) and Anna Strong (Heather Lind) against the British. “TURN: Washington’s Spies” Season 1 Blu-ray Box Art. As well as the above, the first season cast also included Meegan Warner as Mary Woodhull, Kevin R. McNally as Judge Richard Woodhull, Burn Gorman as Major Richard Hewlett, Angus Macfadyen as Major Robert Rogers, Samuel Roukin as Captain John Graves Simcoe and JJ Feild as Major John André. The second season will feature new cast members Owain Yeoman as Benedict Arnold and Ksenia Solo as Peggy Shippen and has already finished shooting. At the tavern, Rogers (Angus Macfadyen) tells Judge Woodhull (Kevin McNally) and Abe (Jamie Bell) that he’s putting off his hunt for George Washington for another more sinister target. Comments for “TURN: Washington’s Spies” Season 2 to Premiere on April 13, 2015, First Trailer Released are now closed.